Hi Fawn Friends! Do I have a fabulous product to share with you today! If you follow me on Facebook and/or instagram, you may have noticed a post about a wonderful new product that is on the market, called Neat Cheeks! Neat Cheeks is a product that was created by two mothers that, like all of us, do not look forward to the baby/toddler clean up process. Particularly when it comes time to wipe their cute little face. With Neat Cheeks, the struggle is over. 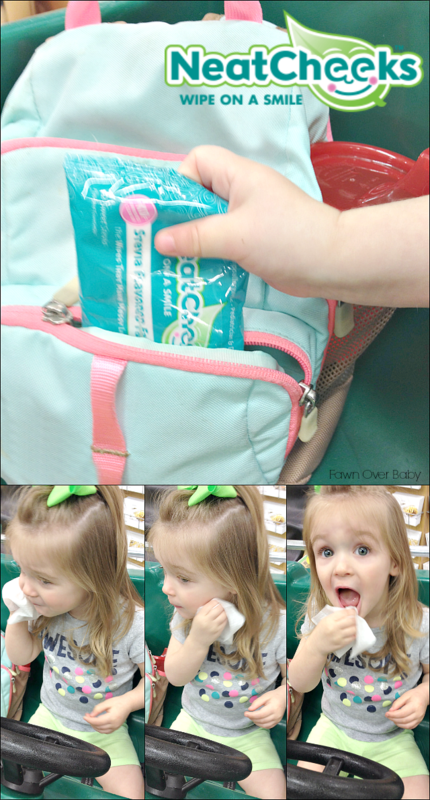 These amazing clean-up wipes are moisturizing towelettes that are made up of all natural ingredients and get this, flavored with a yummy all natural scent, creating a safe, fun and delicious clean up session for your little one! When we are out and about, my usual go to clean-up item is a diaper wipe. It is what I normally have on hand and it gets the job done while sanitizing at the same time. Now and then I get a little worried about using these on my baby's sensitive skin. Luckily the genius mommies at Neat Cheeks have put those worries to rest and I can easily grab a wet wipe for clean up without anxiety and without a fidgety toddler swapping my hand away. In fact, she welcomes it and if left up to her, the package would be empty after 10 minutes of wanting to clean her face with every last towelette. That's where the yummy flavor comes in handy! Sodium Lauryglucoseides Hydroxypropyl Sulfonate - a naturally derived, sulfate -free cleansing agent. It is very gentle and biodegradable. Used in products for those with sensitive skin. Citric Acid - used to optimize the ph of a formulation as well as help refine and renew skin texture. 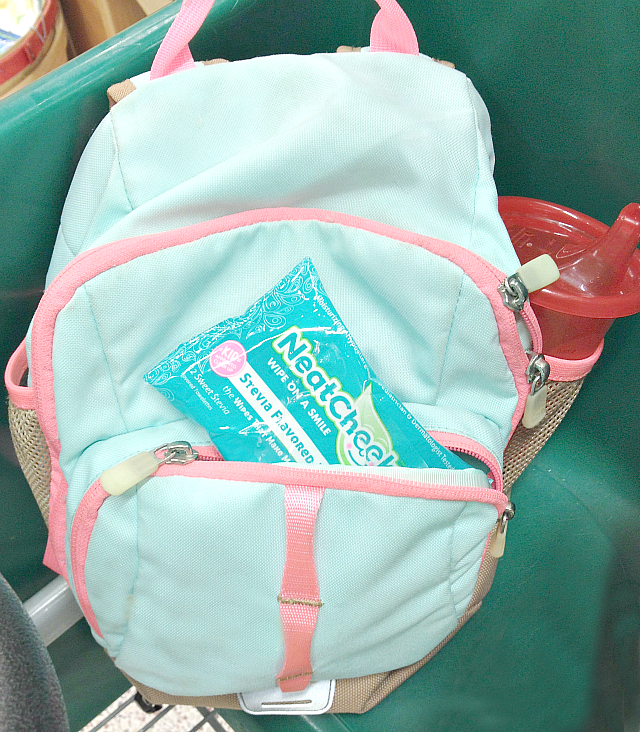 These little life savers come in a small and convenient package consisting of 12 towelettes making it easy to grab on the go and/or slip into your diaper bag, hand bag or even pocket! Grocery Store trips can sometimes be a little loud at times, especially when we go close to nap times. So my daughter always gets a free cookie from the bakery to help settle her nerves while we shop. Of course after the consumption of a chocolate chip cookie comes clean-up. My daughter enjoys Neat Cheeks wipes so much, she grabs a wipe all on her own and cleans up herself. Que the chorus "Hall-le-luyah" - one less thing I have to battle with while out and about with my toddler! Im so thrilled about this yummy new baby/toddler clean-up invention and I know you will be too. 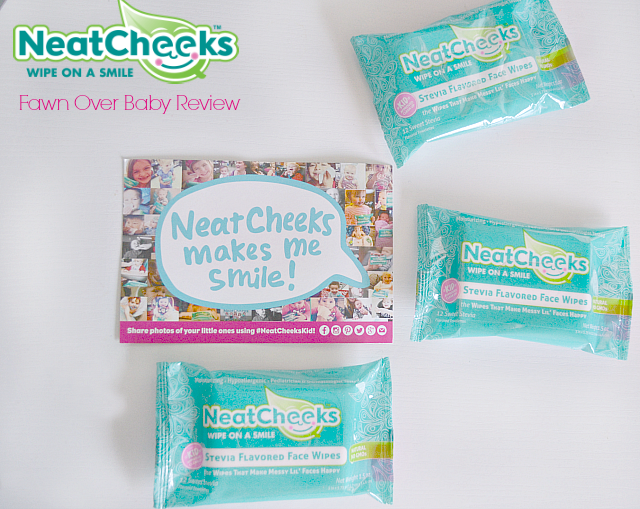 If you would like to make your little one smile from cheek to cheek, feel free to pick up a package at Neat Cheeks.com today! You will be so glad you did!